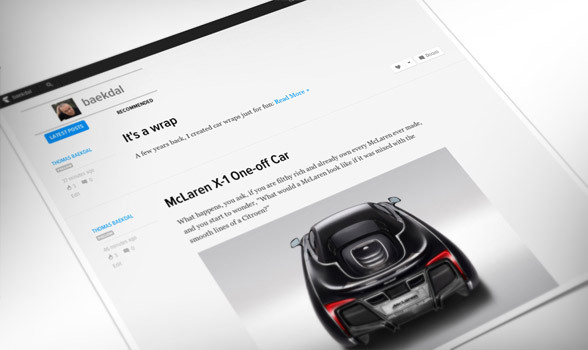 Gawker just launched the 'New Gawker' ...starting with Jalopnik. It's a beautiful and simple site (maybe too simple as there are very few cues as how to find more content if you come directly to a single article). And it is responsive, so it's designed for mobile first. "There are a few great new tools, including the ability to "heart" stories and comments, as well as "follow" or "block" anyone in the system, including the Jalopnik staff. We've also added image annotation, which will allow you to comment directly on the photos at the top of a post." But that's not the big news. The big news is that Gawker will combine publishing with a community blog like feature... very similar to Tumblr. "Have you always wanted a blog in our network? You can do that, too." "Want to create a blog about Fox Body Fords? Go nuts. Want to create a site devoted to Starfox Cosplay? You're strange, but go ahead and do a barrel roll!." "All blogs are created equal. Your blog will look similar to our flagship sites and will have all the same tools, including image annotation. Any user in the Kinja universe can follow you. Tag something "Starfox" and it'll show up on the kinja.com/tag/starfox tag page so other people can find it." I just created a simple blog to try it out: http://baekdal.kinja.com/ ... and it is really very well made (super simple and yet a very powerful platform). But it doesn't stop there, because you, as a reader (and blogger), can repost any article from the Gawker Network, and Gawker can in turn repost anything that you blog about. "If you want, you'll also be able to republish articles from our site (and eventually all Gawker sites) and we'll be able to do the same. If we do republish something you created you'll get the byline, the credit, and it'll be clear where it came from." That's both good and bad, but this does take Huffington Post's 'free blogger' concept to an entirely new level. "When we look for the next generation of writers for our site, and other sites, we'll be looking at who does well in Kinja." What will the next generation journalist be? A person who have spent four years in journalist school? ...or a person who have proven herself through her writing and community building? That's another interesting trend right there (for better and worse). Anyone can be a journalist, and a journalist can come from anywhere. We have the trend of mobile first (and not as in mobile for a specific device. No, mobile for multiple devices... as in anytime, anywhere, anyway you want it). We have the trend of no packages. The front page is really not that important, everything is designed for the performance of the single page. Also, can you imagine this as a 'monthly issue'? We have the trend of sharing and engaging, of which the entire site is build around. We have the trend of following. You can follow and/block anyone... which in turn creates personalization. We have the trend of community building. It's not just a site that you visit. It's a part of your identity, and your home. We have the trend of citizen reporting, which is what Gawker will tap into by reposting posts by their readers. That's a lot of free content right there. We have the trend of social aggregation, in that people can share, mashup, mix the content any way they like... and Gawker can do the same. We have the trend of being a platform, which the blog part is all about. There are so many really exciting things about this... as I said before, for better and worse. Some of the problems is that Gawker, like many other platforms, is designed around exploitation... as in getting people to do a whole lot of work for free, which Gawker can then monetize. We have the problem that it is locking people into a platform that creates a kind of Stockholm syndrome between the blogger and Gawker (similar to what we experience on Facebook). We have the problem with copyright, in that Gawker's readers can post whatever they want... including content that aren't their own. And Gawker can then republish it, pretending that they didn't know, while getting a ton of traffic. Those are all big problems. But no matter how we look at it, the trends are super-exciting. We are starting to see an entirely new form of publishing company. In the past, publishing meant that you were the bringer of news. There is still a lot of that on Gawker, but the trend that we see here is not about being the bringer of news, it's about being the creator versus the connector of news. Gawker, of course, tries to do all of the above... again, for better and worse.